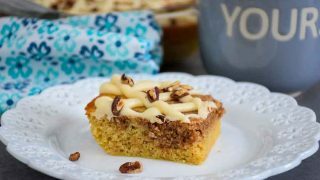 This Pecan Coffee Cake is a low carb breakfast cake with an almond butter cinnamon swirl and sweet buttery vanilla drizzle. It makes a great brunch with a hot cup of coffee, but also can be served as an after dinner dessert! 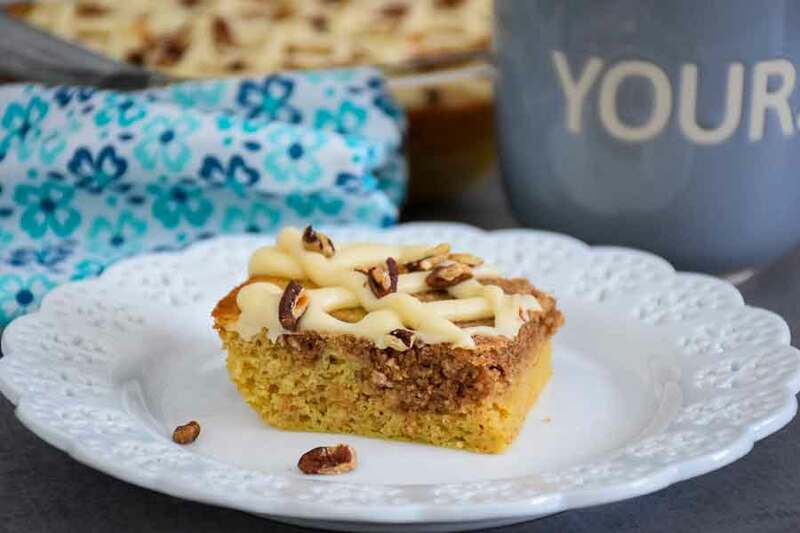 Our favorite time to have this Pecan Coffee Cake is for a weekend brunch with a steaming hot cup of coffee. I love making it at the beginning of the weekend so we can have breakfast in the morning, and dessert in the evening, both weekend days! 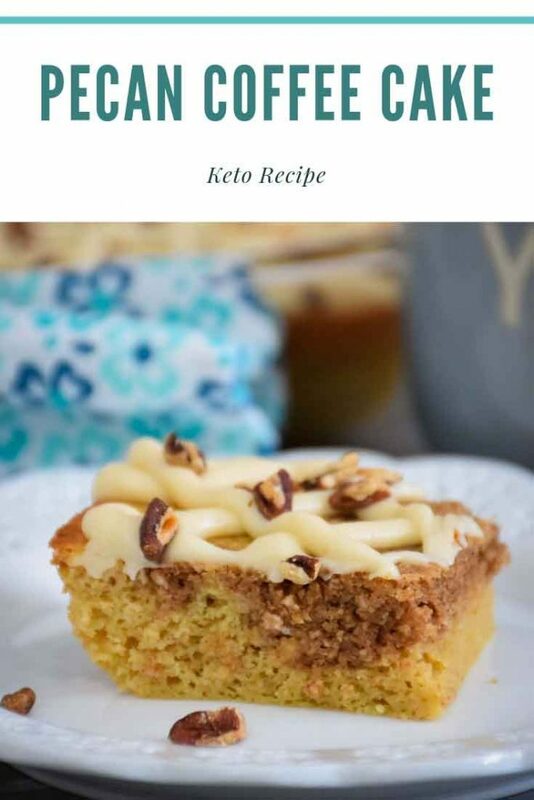 Keto Pecan Coffee Cake for the Weekend win! Weekends are always relaxed in our home. While I have always been an early riser, Grumpy is not! As a result, I like to have something like this Pecan Coffee Cake for breakfast on the weekend. That way, we can both enjoy a piece whenever we feel ready to eat! I also try to make smaller batch recipes, however, for this particular recipe, I decided to go full sized. With only two of us in the house, usually a full 12 serving size recipe is too much. However, in this case, it didn’t turn out that way. Grumpy loved this so much, it was breakfast and dessert! So, this Pecan Coffee Cake lasted a little more than two days for us. Win for me since I only had to bake once for the weekend. And, win for Grumpy since he was satisfied all weekend long! A low carb breakfast cake with pecans, cinnamon swirl and a vanilla drizzle. 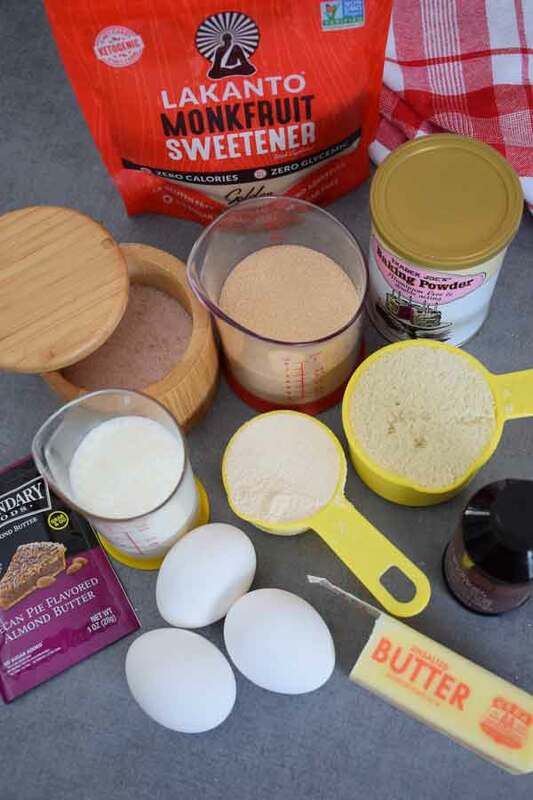 Measuring your ingredients before any mixing will make your recipe making go smoother! 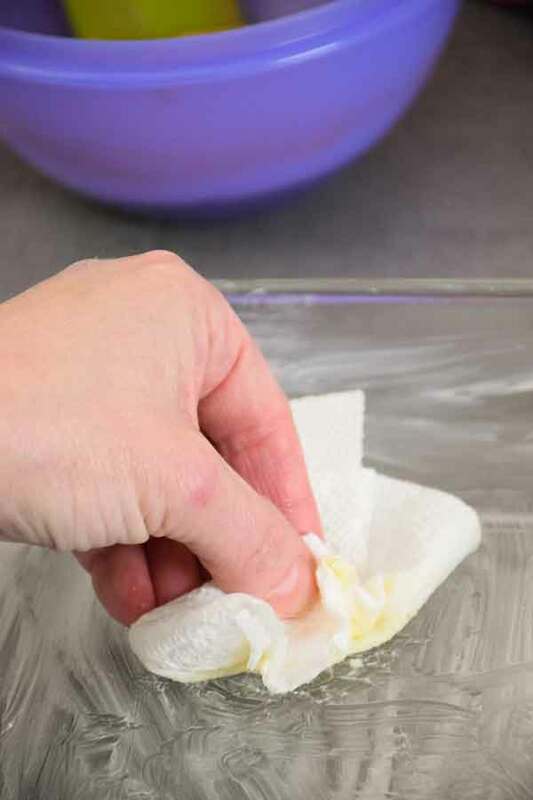 Using a paper towel and softened butter, smear the butter over the bottom and up the sides of your baking pan. 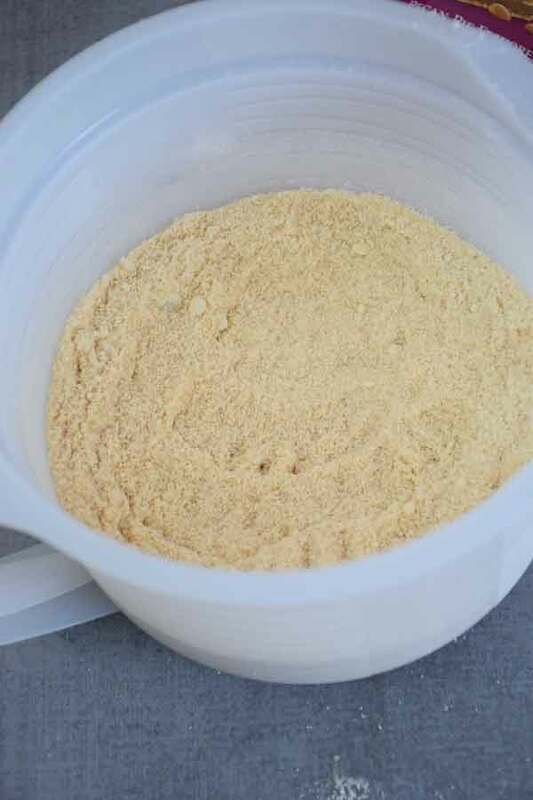 Add your almond flour, coconut flour, Monkfruit brown sweetener, salt, and baking powder to mixing bowl and whisk to combine. In a 4 cup glass measuring cup, whisk together eggs, water, and heavy cream. 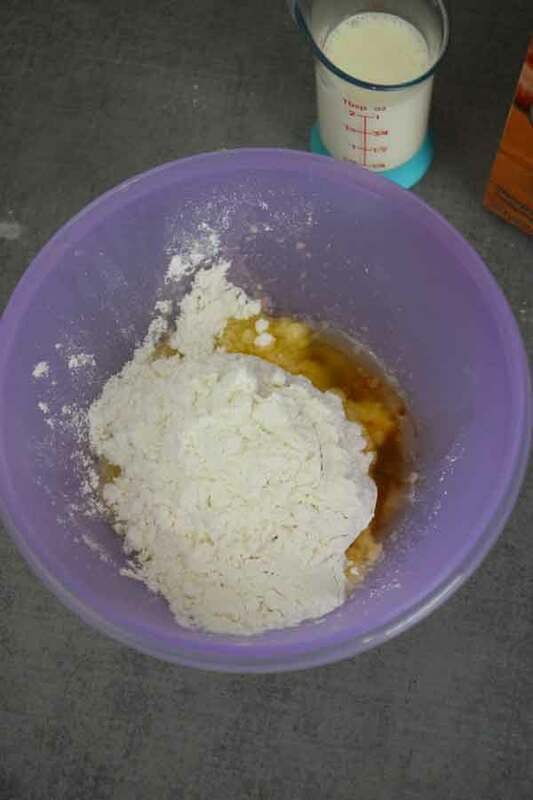 Add melted butter and egg mixture to flour mixture. Remove 1 cup batter and mix in almond butter. 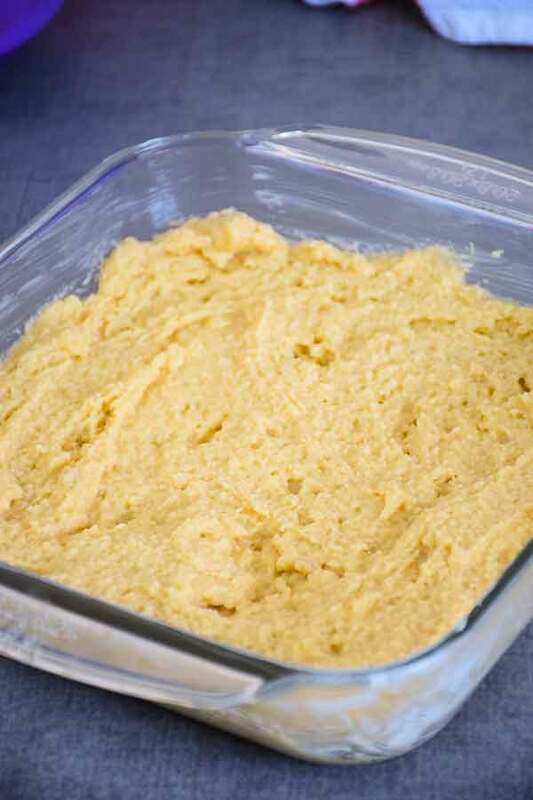 Once your batter is combined, remove 1 cup of batter and place in small mixing bowl. Add to it 28 oz almond butter. Stir until combined. 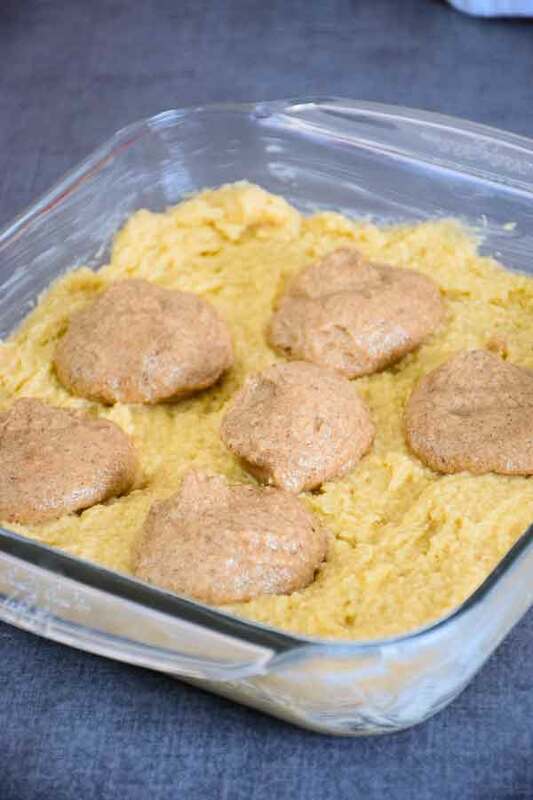 Place batter in baking dish and spread to cover bottom of pan. Spoon approximately 1 tbsp of batter evenly over cake layer. 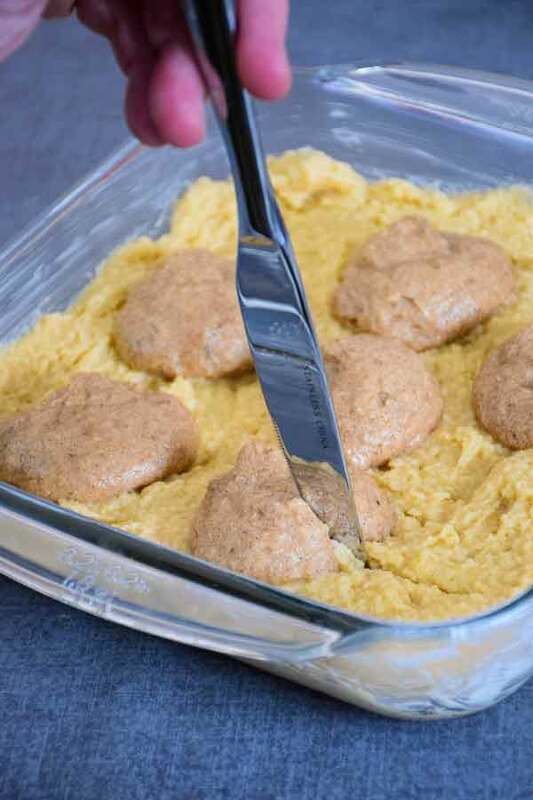 Using a butter knife, place tip in baking dish just in front of a dollop and drag through batter to swirl two types of batter together. 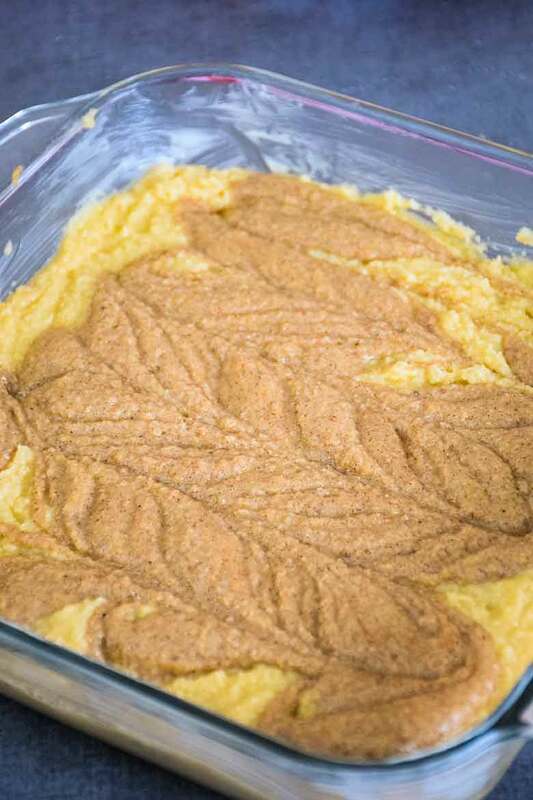 Once the batter is swirled into the coffee cake base, it is ready to bake. Mix together the swerve powdered sugar, butter, vanilla, and heavy cream until icing is smooth and creamy. 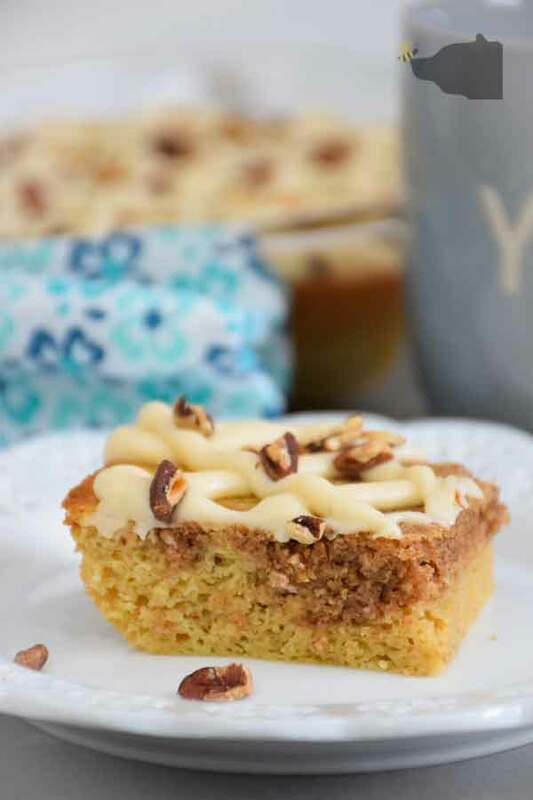 Drizzle with icing and top with chopped pecans. Work quickly when adding batter to your pan. 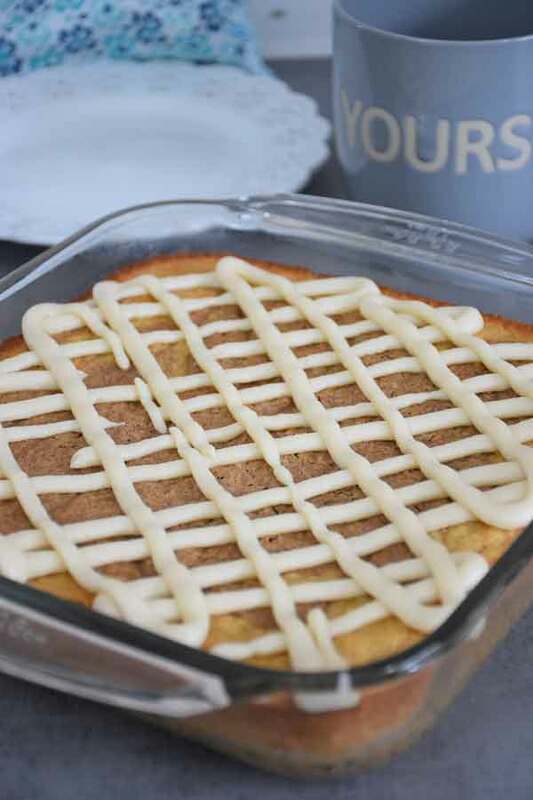 Because there is baking powder in your batter, your coffee cake will resemble a thick pancake batter. For this reason, don’t be alarmed if it is not smooth like a regular cake batter. Your cake will still swirl and bake up nice and tall! When swirling your almond butter batter through the cake, you will want to put the knife to the very bottom of your pan. Move in an S shaped motion through each dollop. If your icing is too thick for you, it is ok to add a little more heavy cream. Just add it about 1/2 tablespoon at a time. To easily drizzle your icing on top of your cake, use a sandwich baggie. I place the baggie in a cup, wrap the opening around the lip of the cup to keep it open, and put the icing in the baggie. I then will snip the corning of the baggie and squeeze over top of the cake in a zigzag pattern. 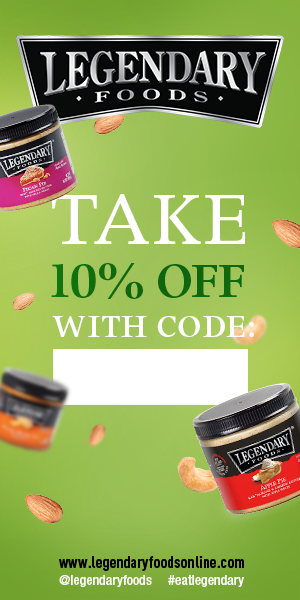 Have you tried Legendary Foods nut butters? The following are affiliate links. We are a participant in the Legendary Foods Affiliate Program, an affiliate advertising program designed to provide a means for us to earn fees by linking to Legendary.com and affiliated sites. I fell in love with Legendary Foods products when I received a sample in a subscription box. I have two favorites. Pecan Pie and Peanut Butter Cup, but the other flavors are awesome too! 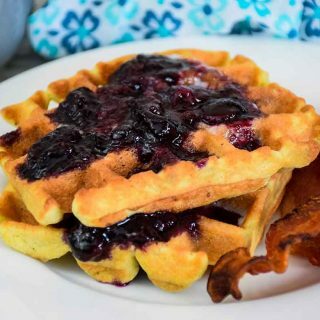 I love their Blueberry flavor and use that in my Blueberry Waffle Recipe. I hope you will take advantage of their offer and try some out! What’s new? Get 10% off of your order from Legendary Foods with the code GrumpyHB! Just click the box below to get your discount! Thanks so much for being a part of Grumpy’s Honeybunch! A vanilla flavored cake with a pecan pie flavored almond butter batter swirl. Topped with a vanilla icing and chopped roasted pecans. 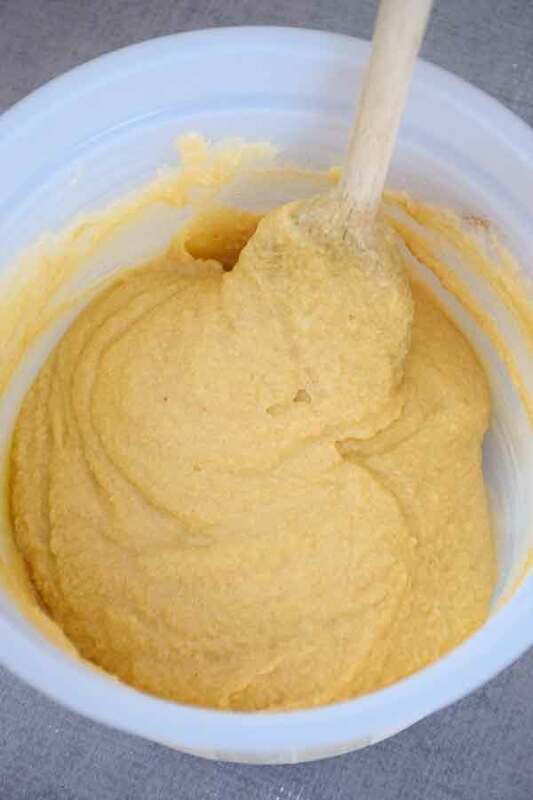 In a large mixing bowl whisk together almond flour, coconut flour, Monkfruit sweetener, baking powder, and salt. In a large 4 cup glass measuring cup, whisk together eggs, vanilla, water, and heavy cream. Make a well in center of dry ingredients. 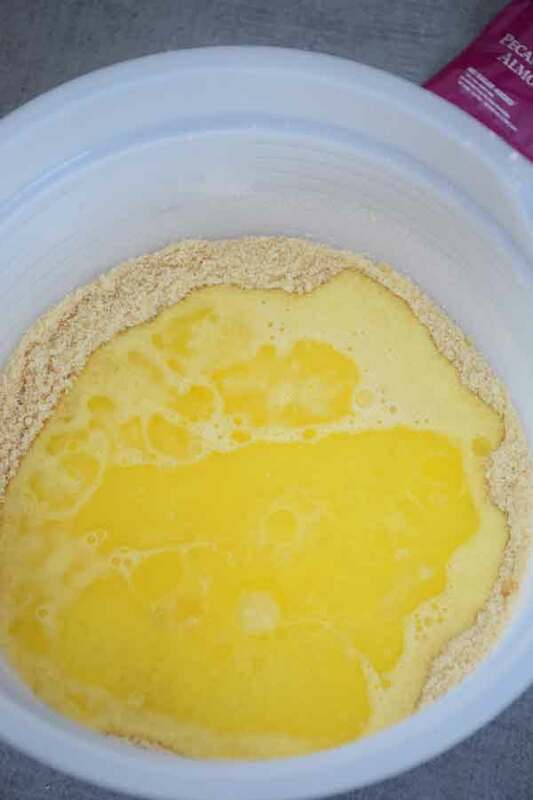 Add egg mixture and butter to dry ingredients and stir to combine. 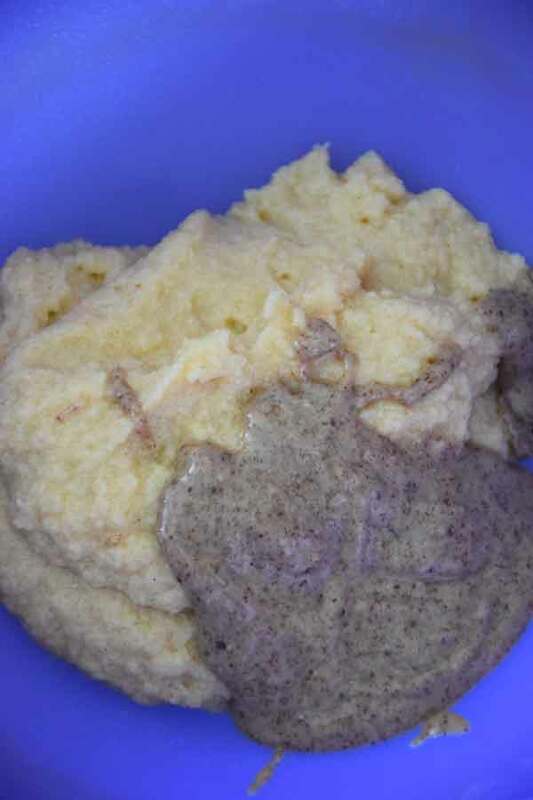 Remove 1 cup of batter from bowl and place in a smaller mixing bowl. Add 1/2 teaspoon cinnamon and 28 ounces pecan pie almond butter to batter. Stir to combine. Add plain batter to baking dish and spread to cover bottom of pan. Place dollops of almond butter batter on top and swirl batter with a knife. Bake in 350 degree oven for 30-40 minutes or until toothpick comes out with just a few moist crumbs. 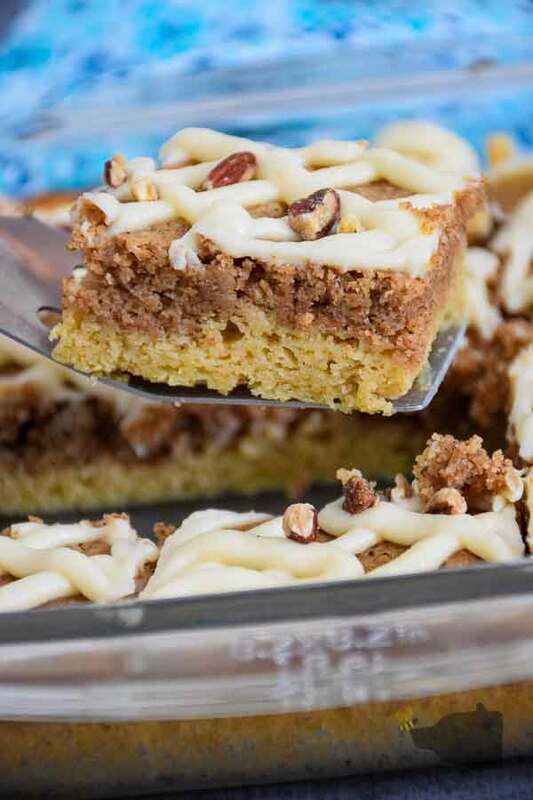 While cake is cooling, add Swerve 1/2 cup confectioners sweetener, 2 tbsp melted butter, 2 tbsp heavy cream, and 1/2 tsp vanilla extract to mixing bowl. Stir until well combined. Add more heavy cream as needed to obtain desired consistency. Drizzle over baked cake. Store any leftover cake on the counter for up to 3 days or in the refrigerator up to 1 week. You can easily substitute regular almond butter if you don't have the Pecan Pie Almond Butter. If you wish, just add a tablespoon of chopped pecans, a teaspoon of sweetener, and about 1/4 tsp cinnamon to your regular almond butter.